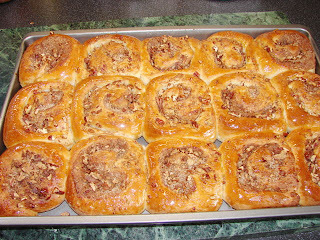 Love the smell of hot cinnamon buns. I got some pecans that need using and thought of adding some for additional crunch. Tried it and it was lovely. Here is the recipe. 1. Beat the egg in a measuring cup, add enough milk to make up to 280 - 290 ml of liquid. 2. Put all the bread dough ingredients in a bread machine and mix for about 10 minutes. 3. Leave to rise for about 40 – 45 minutes. 4. Tip the dough onto a lightly floured surface, give it a quick knead. Roll it out to a 30 x 25 cm rectangular block, keep the edge straight as possible. 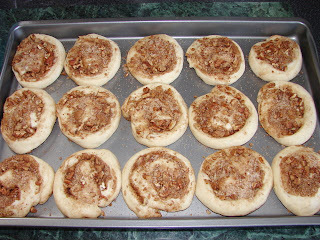 Sprinkle on the cinnamon sugar and pecan. Roll the dough up into a log, wet the edge with a dampened fingers. Press and stretch it out a bit. Cut into 14 – 15 pieces. Gentle pick up each piece and put on a non- stick/ greased/ parchment line baking tray. You need one large baking tray like mine or 2 normal size trays. 5. Leave to rise for about 1 hour till double in size. 7. Brush with honey or syrup to keep them shinny and sticky. The Cinnamon that we buy in the US is actually Cassia. Please click the below link to read more. It was real cinnamon powder without added sugar that I used. The amount of sugar I added was about right for me maybe not for you. Are you sure in US cinnamon is cassia? I do go the US on frequent visits and have bought cinnamon sugar before. I am Chinese and use cassia only for Chinese and Indian cooking. Never heard of cassia being poisonous. Chinese has been using it for thousand of years. Like all things moderation is the word. Cinnamon whoever you are, I have just clicked on your profile and it leads to a website selling cinnamon. Please do not reply again or I will delete your post. I do not like people using my blog to advertise their products. these look great! can just imagine the divine smell they must make when cooking!